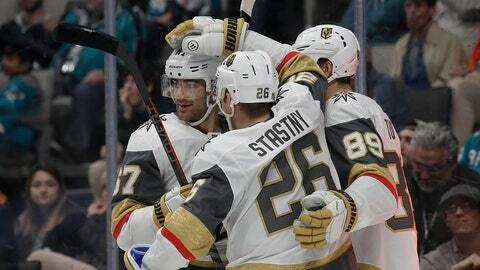 The Golden Knights could have had even more when they got a power play late in the period after Micheal Haley took exception to Ryan Reaves‘ hard hit on Melker Karlsson before a line change. Haley rushed over and tried to pull Reaves off the bench for a fight, getting a penalty on the play. NOTES: Only two Vegas players had previously recorded four points in a game: Karlsson and Theodore did it last season. … Couture’s first goal gave him 500 career points.